To be considered the real deal, "mayonnaise" must contain egg or egg yolks, vinegar and a minimum of 65% oil by weight. It cannot contain any starches or gums, so eggs are the only emulsifying agent. Mayo is naturally rich in omega-3 fatty acids and is also a source of mono- and polyunsaturated fats. 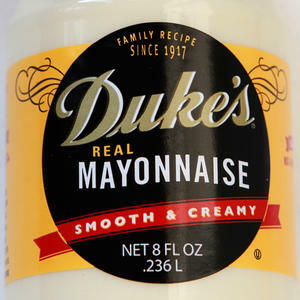 Duke's mayo is free of trans fats, as well- it is a condiment to be enjoyed in moderation. What's the secret behind Duke's flavor all its own? It does not contain sugar! Duke's is the only well-known market brand to possess this type recipe. Instead, Duke's mayo features cider vinegar giving it a nice tang on the tongue. Fun fact: Mayo can be used not only as a condiment but also in baking! Mayo can replace shortening or margarine- try it in your next chocolate cake. Ingredients: Soybean oil,eggs,water, distilled and cider vinegar, salt, oleoresin paprika, natural flavors, calcium disodium EDTA added to protect flavor.